What do you think of when speaking of animated films? I believe that Pixar Animation Studios may first come to mind for many people. Having been in the lead of the animation industry since the late 20th century, Pixar not only takes an important role in people’s memories, but it will also continue to prosper. In appreciation for its supporters, Pixar arranges the circuit exhibition of its 30th anniversary in 15 countries, giving people a chance to closely observate its work in making animations behind the scenes. Around 400 works of the studio’s 16 animated feature films are provided. 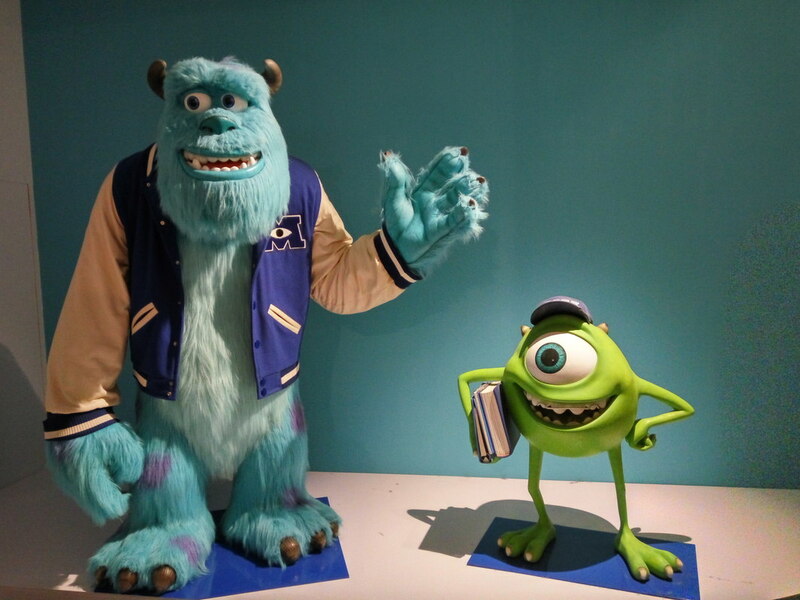 Compared to the 20th anniversary exhibition held in 2009 in Taiwan, this time Pixar displays more works about new animations like Toy Story III, Monsters University, Inside Out, among others. First to come into view is Pixar’s chronicle, on which people can see and learn the origins of Pixar, its transformations, and achievements. Pixar was originally the Department of Computer Animation under Lucasfilm Ltd., inventing and developing systems of editing digital videos, under the leadership of Edwin Earl Catmull. It was not until Steven Paul Jobs bought this department in 1986 that “Pixar” became a formal name and an independent animation company. However, people may think of Disney when it comes to Pixar. In fact, Disney cooperated with Pixar in making several animations until it bought Pixar in 2006; since then, Pixar Animation Studios has belonged to Disney. John Lasseter, the chief creative officer of Pixar, considers character, story, and world to be the three essentials of making a successful animation. A character is not simply an object created by Pixar artists in a film, but it is a “life” imbued with thoughts and feelings. Characters “live” their lives in films, just like humans do in reality. Pixar spends more time and effort on brainstorming on story conception than on the technical skills of making animated images. An animation will not be good if it lacks a reasonable story with meaning and feeling. With an original story concept in mind, Pixar artists start to write a script, draw storyboards, and then create a story reel in which they edit all the storyboards with characters’ dialogues, background music, and various effects for a mock up of a real movie. For Pixar, this whole process is called “plussing,” a special term coined by Walt Disney. During the process of “plussing,” the staff can provide ideas and suggestions anytime. Last but not least, Pixar artists present an imagined world on the screen, a fictional universe with its own rules and time, giving the audience a chance to explore with unconstrained imagination and creativity. In this exhibition, each animated feature film is displayed individually in 12 sections containing those three elements, in order to show how an animation was created step by step. The Toy Story Trilogy, the most popular masterpiece of Pixar, contains a board of brief introduction, but the most appealing parts are the authentic works or reproductions of the preparatory process such as pencil, pen or marker drafts, pastel or ink paintings, as well as characters’ sculptures made of cast urethane resin. These works show how the characters were created and revised again and again. People can see the handwriting of the artists on the pictures, and observe how they designed Buzz Lightyear’s appearance, Mr. Potato’s body parts, or Slinky Dog’s movement. What’s more, storyboards that are composed of a series of pictures help the audience recall the stories. In addition, some documentary films that are kept replaying in the background are opportunities for people to listen to Pixar artists sharing their ideas. Aside from animated feature films, short films made early on also showcase Pixar. Though the previous techniques were not as developed in comparison to more current animations, short films such as Luxo Jr., Red’s Dream, Tin Toy, Geri’s Game, among others, are full of experimental spirit and have laid the foundation for Pixar’s later productions. There is a special area for displays of drafts, and even a small space for a theater mock-up in which people can watch those short films. An exhibition focusing on animation is incomplete without playing animated films. Pixar has specially prepared a ten-minute film for the audience. It is named “artscape,” and condenses the time and the animations Pixar has created over the years. The audience enjoys the amazing first scene in Andy’s room, and then go outdoors into A Bug’s Life by passing through a photo in the room, or later the scene surfaces in the deep ocean of Finding Nemo. Pixar’s zoetrope featuring Toy Story is another highlight of this exhibition. Based on the information provided in the exhibition, zoetrope is a kind of animation equipment popular in Victorian era as toy for kids. There is a cylinder contained in a zoetrope, and as it revolves, a succession of photographs or drawings with images on is demonstrated at speed around the cylinder, producing an illusion of the progressive movements of those images. As a result, the viewers have a hallucination as if concrete objects of the images showed up and kept moving in front of them. In Pixar’s zoetrope, people can see Woody riding on Bullseye, Beatrice performing roping, and Squeeze Toy Aliens jumping up and down as the photos spin around. Before leaving the exhibition area, many people gather in the shooting section to take photos with life-sized versions of James P. Sullivan and Mike Wazowski. There is even an amazing image of them formed with pieces of post-it by the visitors. Developing from a section of a movie company for special effects to a large-scale animation corporation, Pixar has become one of the most experienced and beloved studios for its distinct characters, attractive stories, and uniquely imagined worlds.